Who says learning can't be fun? 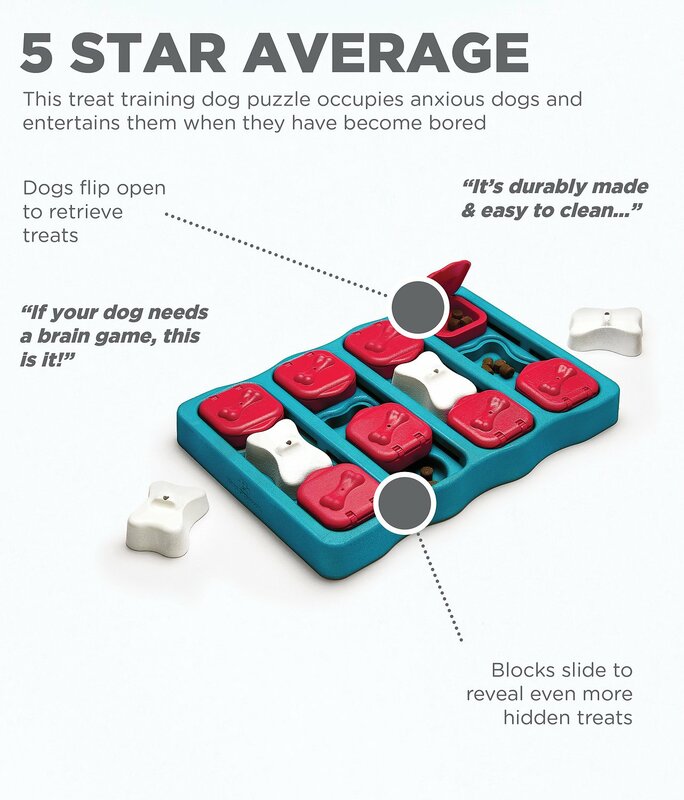 With the Dog Brick Plastic Interactive Dog Toy, you can stimulate your pup's brain and have a blast at the same time! 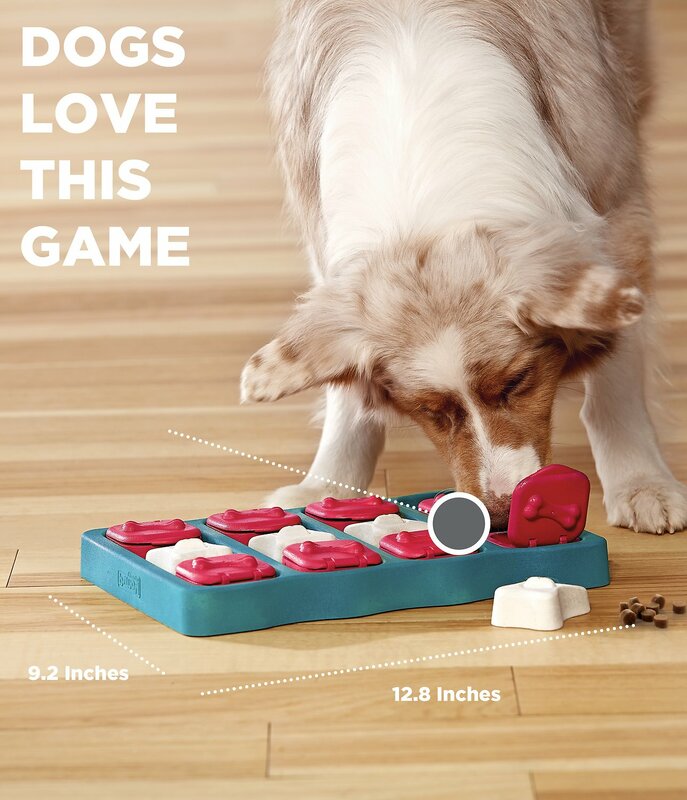 This unique toy is a tricky and activating game for you and your dog. 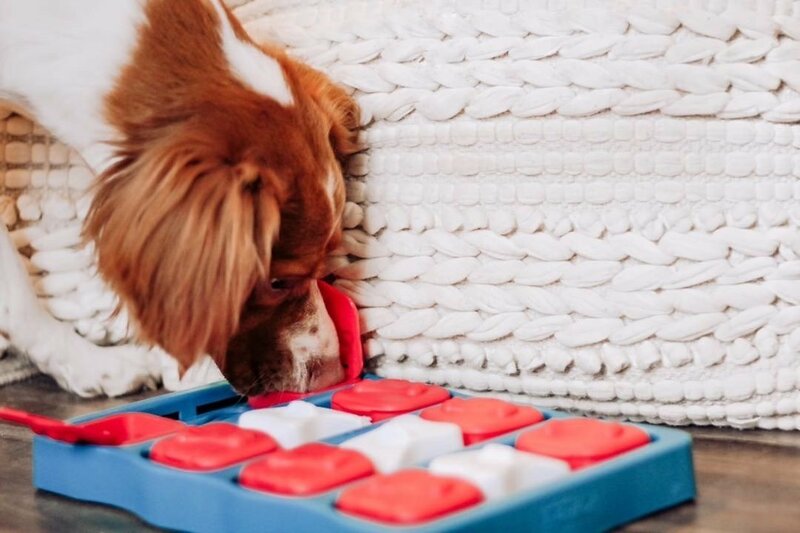 Hide treats in the nook under the sliding discs, and let your dog look for the goodies by trying to pull the discs to the side with his paw or nose. Increase the degree of difficulty by placing the white plastic blocks in the nooks in the middle of the DogBrick. Your pup will love the reward for a job well done, and you'll love watching him put on that doggy thinking cap! 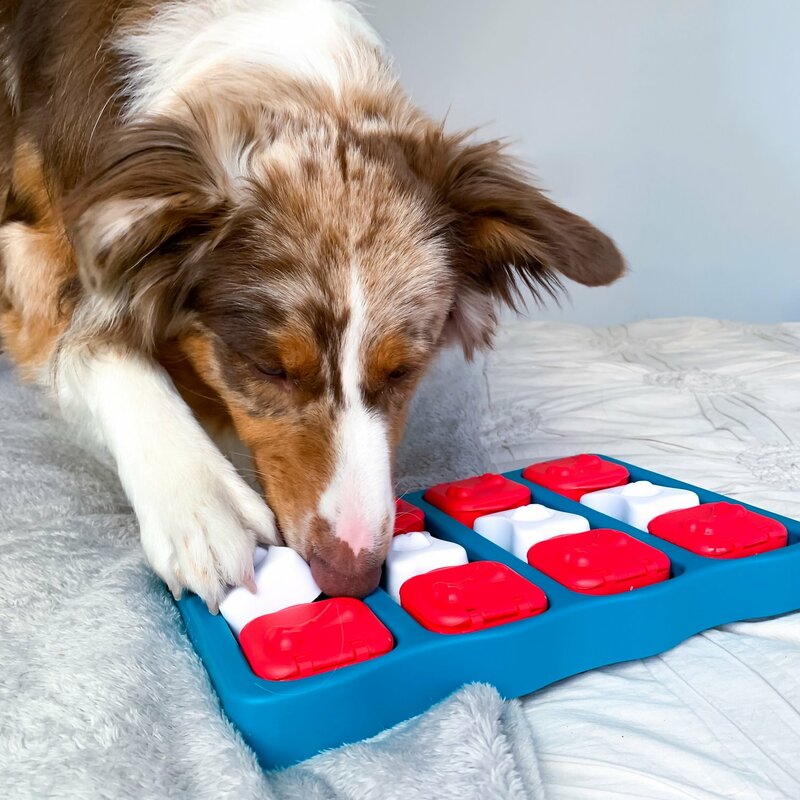 Provides mental stimulation to help keep your dog's mind alert. Level of difficulty 2 and 3, for the more advanced treat hunters. 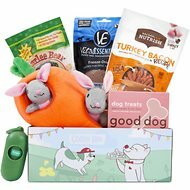 Hide the treats and watch your pup paw and nose them to reveal their prize. Enhances your relationship with your dog by rewarding him with treats he loves. Change the difficulty by using the white plastic blocks placed over the treats or just sliding the brown discs. Easy to Clean: To wash your dog’s DogBrick, simply remove all treats/kibble and hand wash with warm soapy water, rinse clean and dry. Fill again for more fun! I was so excited when this toy arrived and I quickly filled it with treats and proudly showed it to my Springer Spaniel. He showed zero interest, so I put a little peanut butter on a few of the treats and again, he wasn’t interested. I left the room for maybe 10 or 15 minutes tops and when I returned he had chewed to pieces several of the parts, flipped the remaining pieces and had time to finish off all the treats. So much for trying to keep him occupied. I would definitely not recommend this for anyone who has a medium to large dog! Nice Puzzle Toy for small to Medium breed dogs. I bought this puzzle for my toy poodle to work on. She learned how to solve it very quickly, but she enjoys doing it whenever I bring it out. It could be used for scent training, and not just finding treats. I didn't give it 5 stars because I think it's a bit over priced. It is well made. However, it's something to be used with supervision so that a dog doesn't turn the parts into something to chew on. We have a couple of these types of toys for our altogether too smart Corgi. He LOVES them. 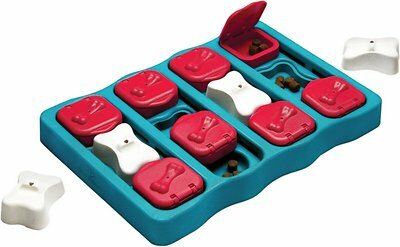 Makes dinner time a fun game rather than just chowing down on a bowl of food. Took him no time at all to learn the steps, he even opens the flaps with his mouth! We have shoe laces in the white bones, they have a hole through them, to give him a grabbing surface. I wish there were more like it, we'd be them all. 1 pug made quick work of this, on it's most difficult level according to instruction. Lids came off... just not a challenging puzzle for them. Should have just thrown their treats on the floor or my cash... Oh yes and the other suggestion about placing it on a footstool or something elevated to make it even more challenging, bad idea because if it slips off there, everything pops open and out. Hopefully chewy will take this toy back or I'll donate it. This toy keeps both of my dogs entertained. Interesting to watch them go about getting the goodies out. One of them gently pushes the boxes until she opens them, the other one approaches the toy with brute force, I.e. paws. 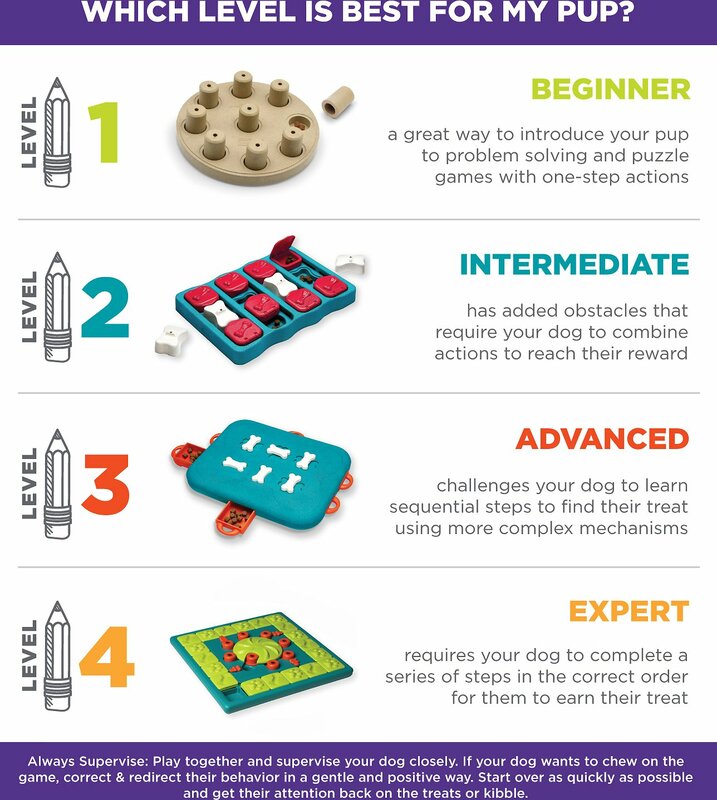 What I like is that the toy has different difficulty levels to challenge the dogs. One small complaint is that the doors of the boxes come off easily, I wish they wouldn’t. I need to get another one so they each have their own. So I just spent $20 on this treat puzzle. My girl Aussie sniffed, and turned up her nose at it and walked away. My boy Aussie, who is extremely food motivated, figured it out and gobbled up all the treats in under a minute. I think there is a harder version, but thinking I won't waste the money. My dog loves games and has quite a few. Tried this for the first time today and he loved it. He was able to quickly figure it out with no coaching from me. The red lids pull off, but they also snap right back on. As with all games, you should stay with your dog. And for this one it's especially important because the dog could easily chew up the bones and/or those snap off lids. This literally lasted less than five minutes. My dog who is not even a heavy chewer cracked one of the flippers immediately. Very disappointing. It also promotes guarding behavior so if that is a issue for your dog pass on this one. I haven’t really had any issues with defective toys from Chewy before. I’d stick with a Kong.